Amid anti-government protests, attack blocks access to stock exchange and ministry of foreign relations. Online activists have attacked and at least momentarily disabled several Tunisian government websites in the latest act of protest against the country's embattled leadership. As of Monday afternoon, local time, at least eight websites had been affected, including those for the president, prime minister, ministry of industry, ministry of foreign affairs, and the stock exchange. The attack, which began on Sunday night, coincided with a national strike, planned to take place on Monday, that organisers said would be the biggest popular event of its size since Zine El Abidine Ben Ali assumed the presidency. The strike comes on the day that school students return from their holiday. Ben Ali's administration has tightly restricted the flow of information out of Tunisia since widespread protests began on December 17, following 26-year-old Mohamed Bouazizi's suicide attempt. But reports of civil disobedience and police action filtered out on Twitter on Monday, with some users reporting the use of tear gas by security forces. 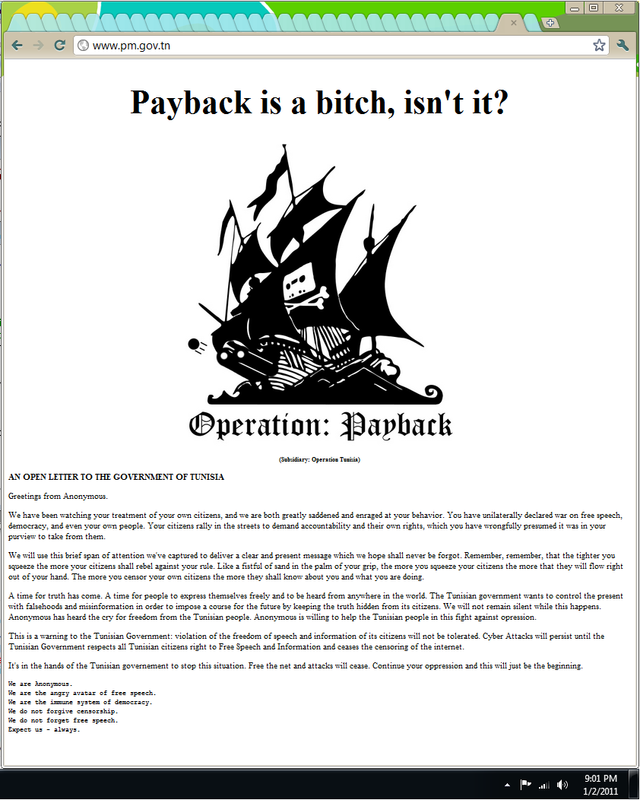 The loosely organised hacker group Anonymous claimed responsibility for the cyber attack, which it called "Operation Tunisia", an apparent arm of the group's broader effort - termed "Operation Payback" - aimed at taking retribution against governments and businesses viewed as hostile to the similarly amorphous document-leaking group WikiLeaks. Operation Tunisia came just days after a similar attack on Zimbabwean government websites;in that case, Anonymous said that it had targeted Robert Mugabe's administration for actions taken by officials to suppress information about the thousands of secret US diplomatic cables that WikiLeaks has released. But on Monday, Anonymous and its followers sought to tie their cyber attack to the ongoing protests and social unrest in Tunisia, not WikiLeaks. In a manifesto reportedly posted on the prime minister's website but later removed, the group said that it was "enraged" at the Tunisian government's behaviour, and that Ben Ali's administration had "unilaterally declared war on free speech, democracy, and even [its] own people". "Anonymous is willing to help the Tunisian people in this fight against oppression," the statement said. "Cyber attacks will persist until the Tunisian government respects all Tunisian citizens' right to free speech and information and ceases the censoring of the internet". Sami ben Gharbia, a Tunisian exile living in Europe who monitors online censorship in the country, told Al Jazeera that Monday's sabotage was the first time he had seen an international group like Anonymous target a Tunisian website. Gharbia said he had witnessed the hackers planning the "denial-of-service" attack in a chat room arranged by Anonymous and that it appeared Tunisian users were among those participating. The protests in Tunisia, which have led to three confirmed deaths, have garnered comparatively little attention in the Western media, which closely followed developments in 2009 in Iran when hundreds of thousands of citizens protested presidential election results. Western governments have been similarly reticent about voicing criticism of Ben Ali's government, or its response to the protests. The country is a popular European tourist destination and has been praised by the World Bank for its financial policies. But many within the country say the image of calm and success belies simmering resentments and unemployment rates that reach 25 per cent in certain areas. In private, the US has said that Tunisia's corruption - a contributor to the unemployment driving many to protest - is getting worse. A 2008 diplomatic cable signed by Robert Godec, the US ambassador, and released by WikiLeaks in December describes both low- and high-level corruption in the country that scares away foreign and domestic investors. "Whether it's cash, services, land, property, or yes, even your yacht, President Ben Ali's family is rumoured to covet it and reportedly gets what it wants," the cable states. Gharbia said Monday's cyber attack probably will not affect protests "on the ground" but may serve as a "good story" to attract the mainstream media and embolden online activists in Tunisia. "It might give a sense of solidarity to Tunisian bloggers who have been witnessing censorship for years now, to see such actions targeting the main body of the censorship," he said.